The imagery on this page is the basis for a paper entitled Description of a Cranial Endocast from the Fossil Mammal Vincelestes neuquenianus (Theriiformes) and its Relevance to the Evolution of Endocranial Characters in Therians, by T.E. Macrini, G.W. Rougier, and T. Rowe (2007, The Anatomical Record 290:875-892). The living species of mammals comprise two fundamental lineages, Monotremata and Theria. The monotremes include only three living species (the duckbilled platypus and the spiny anteaters of Australia and nearby islands), while the rest of the nearly 4500 living mammalian species belong to Theria. The species highlighted here, Vincelestes neuquenianus, is the sister lineage of therians. Although not the direct ancestor of therian mammals, Vincelestes is exceptionally important because it gives us an idea of what the ancestral therian might have looked like, and an indication of when the therians originated and began to diversify. Vincelestes neuquenianus is from the Lower Cretaceous La Amarga Formation of southern Neuquén Province, Argentina. Only nine individuals are known, all of which were recovered from a single locality. The specimen presented here is the type and the most complete of the six skulls. Vincelestes shows numerous anatomical features that are transitional between more primitive extinct mammals and extant therians. For example, the cheek teeth of Vincelestes have a "reversed triangle" occlusal pattern that closely approximates the fully tribosphenic pattern of therians, an innovation that enables them to process food more thoroughly. Many features of the internal cranial anatomy of Vincelestes that can not be seen on visual inspection of the skull are readily discernible in the CT slices. This specimen was made available to the University of Texas High-Resolution X-ray CT Facility for scanning by Dr. Guillermo Rougier of the University of Louisville. Scanning was funded by Dr. Michael Novacek of the American Museum of Natural History. The specimen was scanned by Cambria Denison on 02 April 1998 along the coronal axis for a total of 315 slices, each slice 0.21 mm thick, with an interslice spacing of 0.2 mm (for a slice overlap of 0.01 mm). Hopson, J. A., and G. W. Rougier. 1993. Braincase structure in the oldest known skull of a therian mammal: Implications for mammalian systematics and cranial evolution. American Journal of Science 293:268-299. Luo, Z. 1994. Sister-group relationships of mammals and transformations of diagnostic mammalian characters; pp. 98-128 in N. C. Fraser, and H.-D. Sues (eds. ), In the shadow of the dinosaurs: early Mesozoic tetrapods. Cambridge University Press, Cambridge. Macrini, T. E., G. W. Rougier, and T. Rowe. 2007. Description of a cranial endocast from the fossil mammal Vincelestes neuquenianus (Theriiformes) and its relevance to the evolution of endocranial characters in therians. The Anatomical Record 290:875-892. Rougier, G. W., J. R. Wible, and J. A. Hopson. 1992. Reconstruction of the cranial vessels in the early Cretaceous mammal Vincelestes neuquenianus: implications for the evolution of the mammalian cranial vascular system. Journal of Vertebrate Paleontology 12:188-216. Rowe, T. 1993. Phylogenetic systematics and the early history of mammals; pp. 129-145 in F. S. Szalay, M. J. Novacek, and M. C. McKenna (eds. ), Mammalian phylogeny, Springer-Verlag, New York. Wible, J. R., G. W. Rougier, M. J. Novacek, M. C. McKenna, and D. Dashzeveg. 1995. 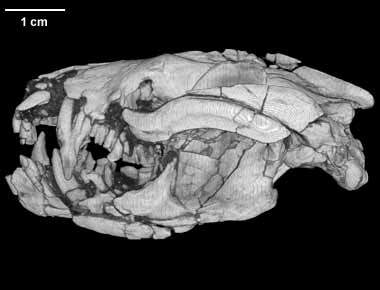 A mammalian petrosal from the early Cretaceous of Mongolia: implications for the evolution of the ear region and mammaliamorph interrelationships. American Museum Novitates 3149:1-19. Click on the thumbnail to the left for a roll animation (2.1 mb) of the Vincelestes cranial endocast. Click on the thumbnail to the left for a yaw animation (1.0 mb) of the Vincelestes cranial endocast. Click on the thumbnail to the left for a still image of the skull of Vincelestes neuquenianus rendered semi-transparent to show the cranial endocast. To cite this page: Dr. Timothy Rowe, 2001, "Vincelestes neuquenianus" (On-line), Digital Morphology. Accessed April 19, 2019 at http://digimorph.org/specimens/Vincelestes_neuquenianus/.